Outer Material:18 oz Matte vinyl use for pressure area, 15 oz finish vinyl use for other areas, which conform to the safety standard of EN14960, EN71, phthalate & lead free. Inner Material: 800 D – 1000 D special vinyl for inner baffle. 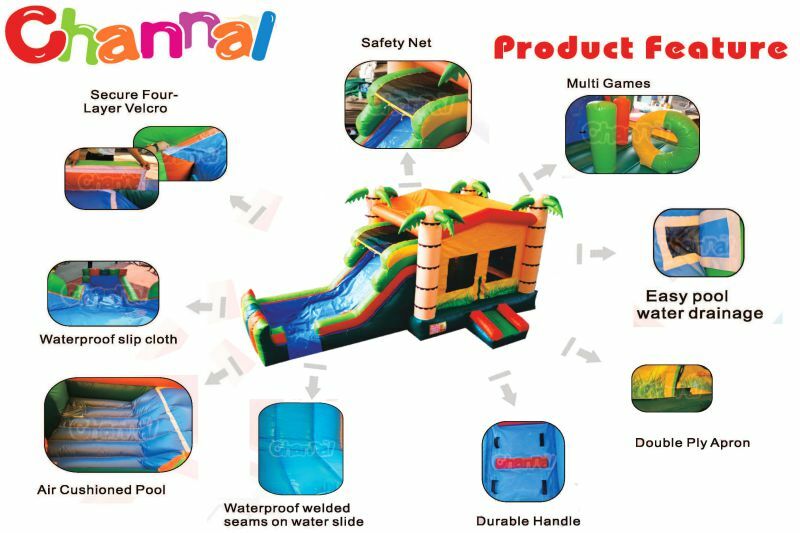 Water slide line and pool are covered by sliding material to better prevent leaking and scratch. All materials are made of 1000×1000 Denier mesh fabric with PVC coating to give the material greater strength and flexibility. All one inflatable products are fire retardant and lead free, and also manufactured to be safe and durable. There is a safety step comes standard on all of jumpers and combos. Anti-Jumping safety netting on all our slides to prevent player’s unsafe behavior. A warning label sewn at the entrance.